Congratulations to "Rachael B. ", the winner in Kat's giveaway. Please contact JUST ROMANTIC SUSPENSE to claim your prize. Thank you to all who participated! I love to travel. I was fortunate to marry a man who also enjoys seeing the world. Though it is difficult to choose my ten favorite cities, Paris would be city #1. There is no more romantic place on earth. Charming streets, a beautiful language, and fabulous food. City #2 is Rome. Roman palaces and temples right in the middle of the city! And more amazing food! City #3 is Athens. Walking along the sidewalk, “Oh, look! There’s part of an ancient temple sticking out of the middle of the street!” It’s definitely unique. City #4 is Venice. Winding narrow cobbled streets and traveling by water everywhere--how fantastic is that? City #5 Stockholm. Another beautiful city whose buildings overlook vast expanses of water. Interesting history there, as well. City #6 Our own New York City. I love the vibrancy, the energy that keep you out late and won’[t let you slow down until well after midnight. Plus it’s a very patriotic place to visit. City #7 Barcelona. Beautiful wrought iron grill work reminiscent of New Orleans. People there are very friendly. City #8 San Francisco. The most stunning views of the bay and some fantastic restaurants. City #9 Quebec. What a lovely French city and it’s just over the border in Canada. Fascinating place to visit. City #10 London. I’ve written a number of historical novels set in England. I fell in love with London on my first trip over. As I look at these, I would probably have to mix them up and start again. All of them are fabulous places to visit and I can think of a dozen more. I hope you enjoyed a glimpse into my travels and that you’ll watch for my new book, BEYOND CONTROL, out May 29th. 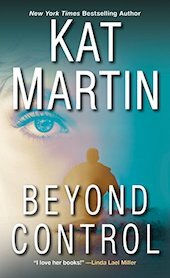 In BEYOND CONTROL, Victoria Bradford and her four-year old daughter are on the run from Tory’s abusive ex-fiancé. Seventy miles north of Dallas, the Iron River Ranch is pretty much nowhere, exactly what Josh Cain wanted when he came back from Afghanistan. Big skies, quiet nights, no trouble. One look tells Josh the pretty redhead who showed up on his door with her adorable little girl will give him trouble of the most personal kind. But Josh has seen trouble before, and he doesn't scare easy. Not when “accidents” start happening around the ranch. Not when Tory’s best friend is abducted. Not even when it looks like their current problems are only just the beginning. Giveaway ends 11:59pm EST June 7th. Due to GDPR regulations you no longer need to submit your email address in the comments. If you have been selected as a winner your name will be posted at the top of the post. You may then contact maureen@justromanticsuspense.com to claim your prize. Your email address will be shared with the author/publicist providing the giveaway. Thanks for sharing! I added this to my want list! I love your books! Thanks for the giveaway. Thanks for the chance to win a copy of Beyond Control! Domestic abuse and controlling individuals are more of a problem than many people realize. When we first moved to our current home, I was surprised how ingrained it is in the local culture. Working as the children's librarian in a county library, I dealt with teens in programs and just talking about books. The girls expected to be pushed around by their boyfriends and parents never seemed all that concerned. It is just the way relationships and men are. We have lived around the country and never been anywhere that had such an obvious and accepted culture of abuse. I have seen it in other areas and out daughter was in a marriage where the husband was verbally abusive. Those who wish to escape such relationships need support and understanding. Laws also need to be changed to protect the abused and punish the abusers. BEYOND CONTROL sounds like it will be another of Kat Martin's wonderful romantic suspenses. I have read here books in every genre and never been disappointed. I love Ms Martin's books and this sounds awesome! i'd love to travel to most of the destinations that are your favorite!